This bank holiday weekend Bluemoose will make a welcome return to Prince Bar Athlone on Saturday, June 3. 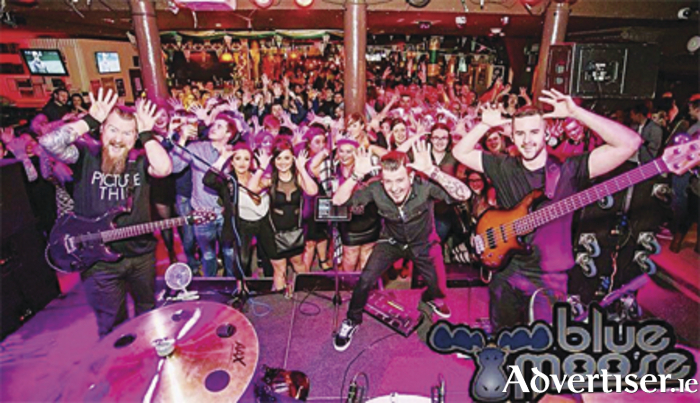 Firmly established as Ireland’s most in-demand wedding and cover band, Bluemoose are constantly on tour bringing their energetic and entertaining live show to packed venues throughout Ireland, the UK, and Europe. Over a decade of touring experience has graced the band with the tools to stage a live show which rivals the atmosphere of an international music festival. With their ever-evolving repertoire of classic rock, dirty pop and anthem showstoppers combined with the sight, the sound, and the smell of a huge rock concert Bluemoose bring the meaning of the term “cover band” to a whole new level! Warm up your weekend on Friday, June 2 when Boithrin will be on stage providing live music. The Prince Bar Athlone will have a full summer line-up of great music every Wednesday to Sunday night. Sunday night is trad night - starting just after 9.30pm, customers can sit back and relax and enjoy the tunes, or if they wish to get up and dance a set they are more then welcome. The music and dance go on until midnight, so if you are into traditional Irish music and dance, or want to give any summer visitors a treat, the Prince is the place to be.